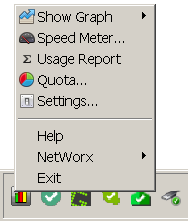 As requested by many users, NetWorx has been rewritten to support platforms other than Windows. It's a preview with partial functionality of the Windows version and we welcome your feedback. Download Mac OS version as a DMG file. Thanks, fixed. You can download the updated build using the same link. Also, I'd like to once again mention that this version has reduced functionality comparing to regular NetWorx. Over time it may reach the same level of functionality, but presently there is no point in using this Windows build other than testing. Just unpack networx_linux.tar.gz and the launch contained NetWorx binary. It's an executable file (ELF). Works well for me under Mint 17....love this proggie on my old Win M/C and very pleased to see it ported. Email me if you need any more info on how its going. Hey, works perfect for Mint 18! I love this on my windows 10 taskbar... any way to add the widget to the taskbar on mint 18 cinnamon? Thanks for your feedback. May be at a later stage, at the moment the goal is to port more functions from the Windows version. After i extract and run in Ubuntu 16.04.1 LTS NetWorx don't show anything, no response. Please check linux version in ubuntu 16.04. Thanks. I've been using this program for ages and I'm thrilled that I can use it on OSX and Linux! Will FreeBSD/TrueOS be supported? Regarding FreeBSD and TrueOS, it's not something commonly used on a desktop, so currently there's no plan to port for these OSes. Okay, i have success run it. But can you add feature application usage in usage report for linux version. I hope this feature available as fast as possible. Thanks. It's a little tricky to implement this for all OSes, in particular on Linux monitoring per-process traffic might require root privileges. We're still looking at possible ways of doing it. Not work on real hardware using my current Mint 17.3 KDE (updated from 17.2) and 17.2 KDE from live cd. As a computer illiterate, I am trying to install Networx in Ubuntu 16.4 on a laptop computer. I have downloaded the networx_linux.tar.gz file (2.0MB), and now also have a file in my "Downloads" folder called NetWorx, listed as a program, of 5.9MB. 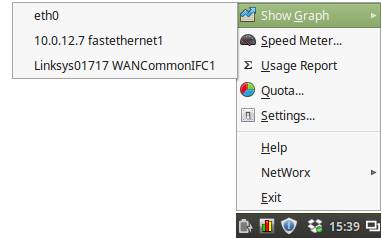 Does this mean that I have "unpacked" networx_linux.tar.gz ? In the instruction "Just unpack networx_linux.tar.gz and the launch contained NetWorx binary. It's an executable file (ELF). ", "unpack" means nothing to me, "the launch contained NetWorx binary" means nothing either. What should I do next? Any chance of more detailed instructions for those of us who know little about computers, and even less about installing programs in Ubuntu. You can try launching the 5.9 MB file, although it may not work without Indicator Systemtray Unity as mentioned above. If no luck, I'd recommend to wait until we officially release NetWorx for Linux as this is a preview version for testing and generally aimed at experienced computer users. It works great in macOS Sierra. 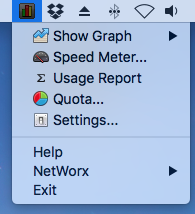 Please add the speed info to Menubar. If you are compiling requests for the next enhancement to the Mac version, mine is to enable sync with other instances on the network. It's priceless to be able to go to one interface and see what every instance is seeing, rather than going to each PC/Mac to get that. On that same vein, is it possible, or is there some other product that would let me see what IP is doing what, without installing NetWorx? I have it on my PCs but I have things on the network that use data that I can't manage, like Xbox, Chromecast, Insteon Hub. I'd love to be able to see stats on those devices. There's a lot of data I can't account for right now, and short of turning things off, it's an issue. A sync feature is planned, similar to the one already present in the Windows version. Though not sure whether it will be cloud-based or purely local. Each way has pros and cons. As to seeing other devices usage - I am afraid that's simply not possible. In a typical home network each device accesses the Internet through the router independently and one device has no way of knowing the usage of others. The router itself might know how much data each device received and sent, but it depends on the router's firmware and usually there is no reliable way to access that information. Yes, here is the 64-bit ELF compressed in .tar.gz. Please tell me if it works on Fedora - that would be good to know. The cause might be that I have also tried the beta version before... maybe this version misread the database from the previous version? Hi, I'm receiving this error below on Linux Mint x64 17.3, exactly the same as mentioned earlier. I have also tried running it using sudo. Are there any steps I can take to debugging this issue? Thanks! The ELF in networx_linux.tar.gz appears to be 64 bit only. Any chance of a 32 bit version?